As the host of her own healthy cooking show, Cook Time with Remmi, Remmi Smith inspires children all over the country to live in wellness. Her Italian salad dressing is sold at Whole Foods Market and other specialty stores. > Read Full Article and See Video. New York Teen Entrepreneur Taps Maple Syrup Profits. Joshua Parker launched Parker Maple Farm from his rural family home in Canton, N.Y., aiming for success in a long and storied tradition, turning sap to maple syrup. > Read Full Article and See Video. Students from Oak Grove Lutheran in Fargo, North Dakota are mastering the game of money managing and national media is all over their success. They have bested some of the nation's Ivy League schools in a recent stock investment competition. > Read Full Article and See Video. 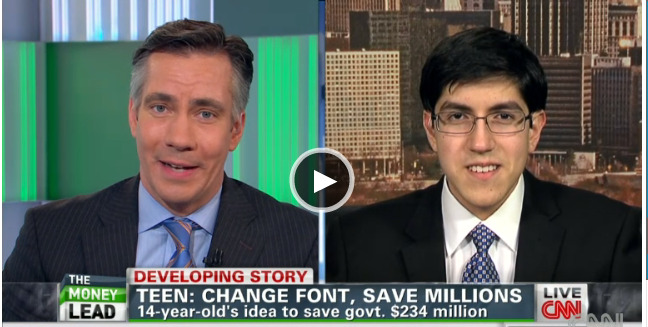 Survir Mirchandani on CNN discussing his idea to save government millions each year. > Also see original article by Suvir Mirchandani and Peter Pinko in Journal of Emerging Investigators. Teen Sneaker Entrepreneur Makes $60,000 On His Website.